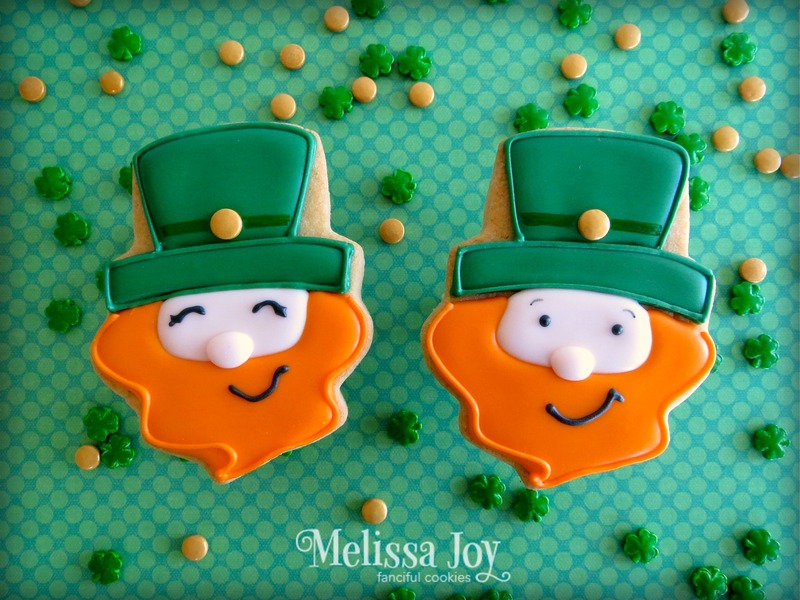 Melissa Joy Cookies | Pretty cookies with organic ingredients, and the stories behind them. 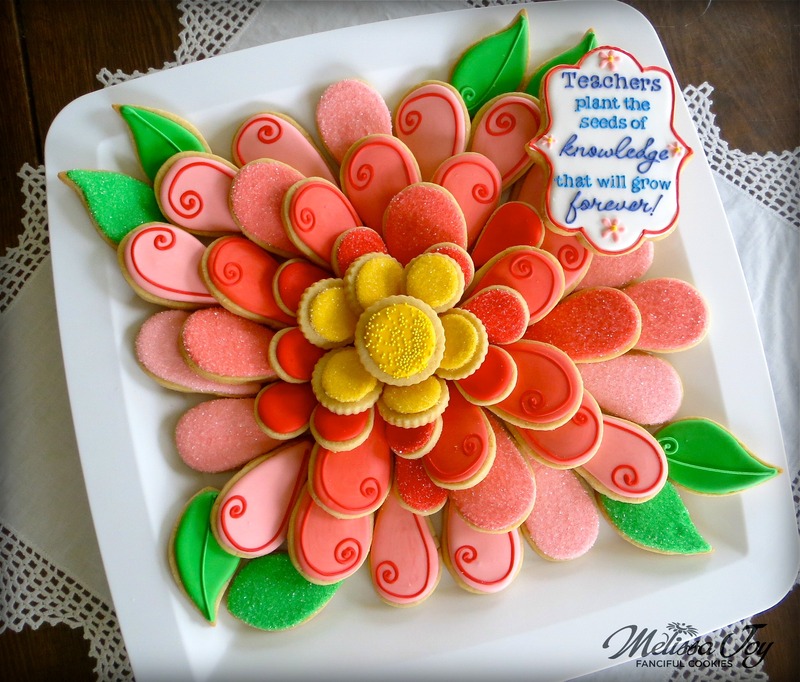 Summertime for Melissa Joy brings the opportunity to not only take cookie orders, but offer cookie decorating classes as well! I’ve got two different options at this time. One is for those who just want to have a little creative fun with a group of friends and the other is for those who’d like an introduction into the art of cookie decorating. I am located in the La Crosse, WI area, so most classes will be conducted here with site to be determined by the number of students interested. I do have a few connections on the other side of the state, therefore additional locations could be possible! Cookie parties are a super way to get together with your friends and have some sweet, creative fun! A two hour party includes decorating instruction, cookies, icing and tools needed to create a 6 to 8 pre-designed set. Cost is $35 per person, with a minimum of 5 participants. If you are hosting the party, your fee is complimentary! These parties will be held in your home, so living in or near the La Crosse, WI area is ideal. Participants must pay in full one week before the party date to secure a spot. Refunds will not be accepted after that time, but your spot can be filled by another person. For further inquiries and availability, email melissajoycookies@gmail.com. 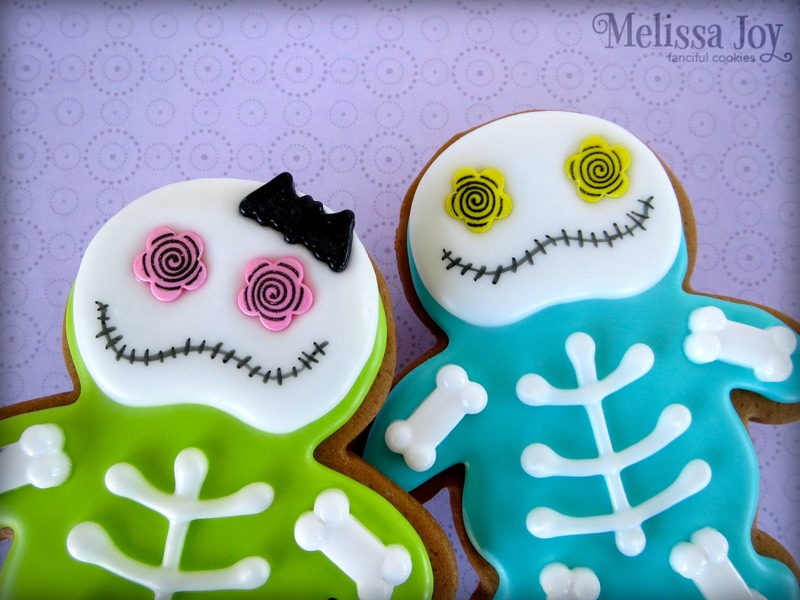 Cookie decorating workshops with Melissa Joy are a more in-depth introduction into creating artfully decorated cookies. 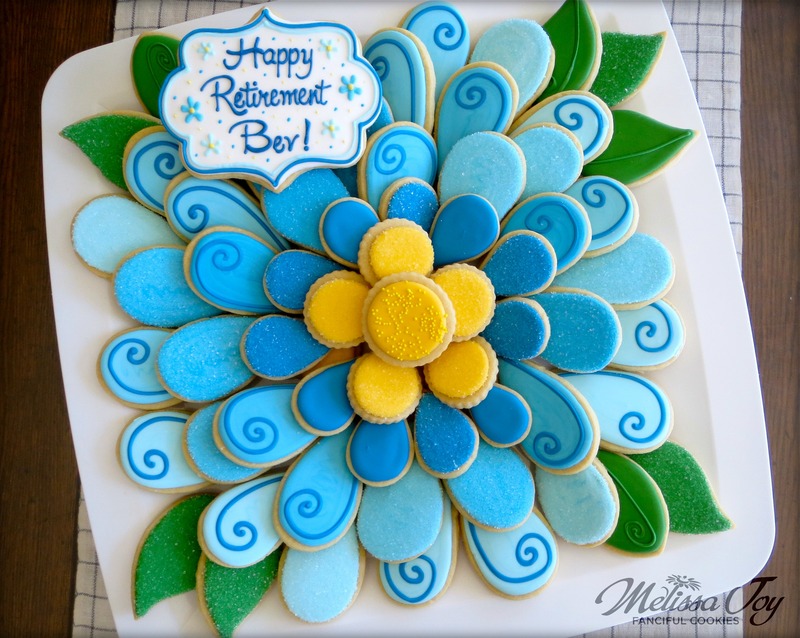 This 3-4 hour class will cover how to make royal icing and its consistencies, as well as techniques including simple flooding, wet-on-wet, brush embroidery, swirl roses, working with transfers or painting on cookies. Little nuggets of wisdom will be sprinkled throughout! Each participant will also go home with a few tools to start their decorating journey. Cost per workshop is $100. Participants must pay in full at least one week before class date to secure a spot. Cancelations will get a partial refund after that time, but spot can be transferred to another person. For further inquiries and availability, email melissajoycookies@gmail.com. Any other questions about classes or ideas for what you’d like to learn are welcome! 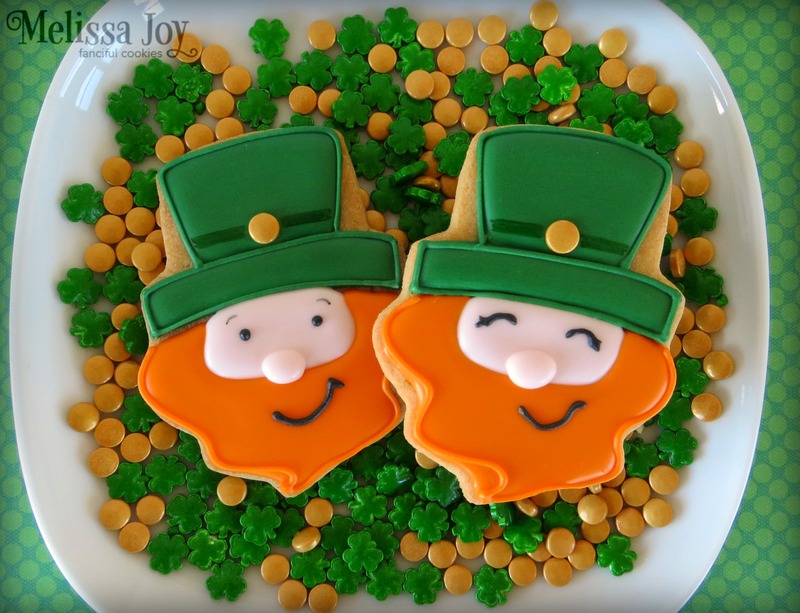 Cookie decorating is a fabulous creative outlet for anyone who wants to give it a whirl. 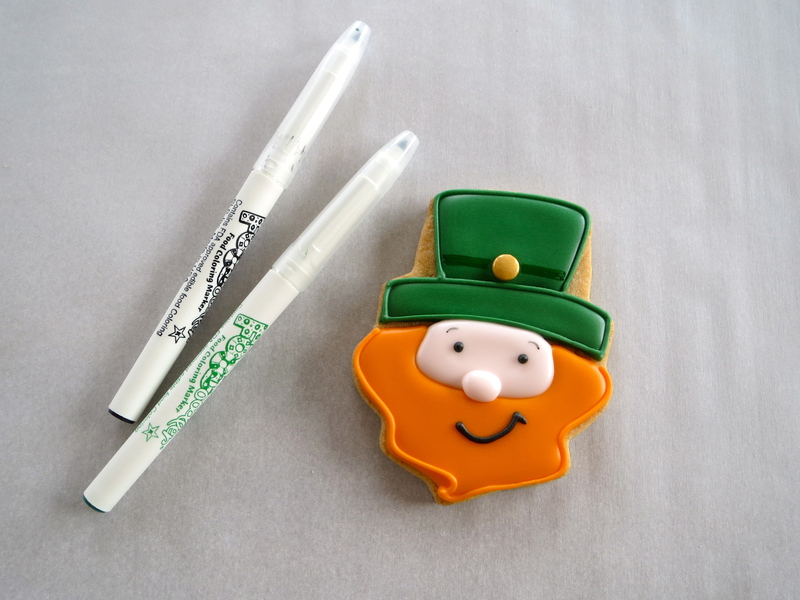 Whether it’s just for a night of fun with the ladies, or the start of your new, delicious hobby, I’d love to share the joy of decorating cookies with you! You guys, it’s been SO LONG since I’ve had the chance to blog, I almost forgot how to post tutorials on here! I’ve been more focused on the selling side of Melissa Joy these days, so the “how-to cookie” stuff tends to fall by the wayside. I’ve added a gallery of my work to the menu bar, organized by category, for those more interested in what I’ve created recently. That is still a work in progress. I’m better at baking than I am at this web junk, but I’ll get there! I used that round cookie cutter as a guide to draw the circles. I’m ornery like that. I used a #2 tip to create the poinsettias. Start with the tip at the center of the flower and drag it out. I have some fabulous, sparkly gold sprinkles I got from CookieCon for the middles, but yellow nonpareils would be great too. And done! 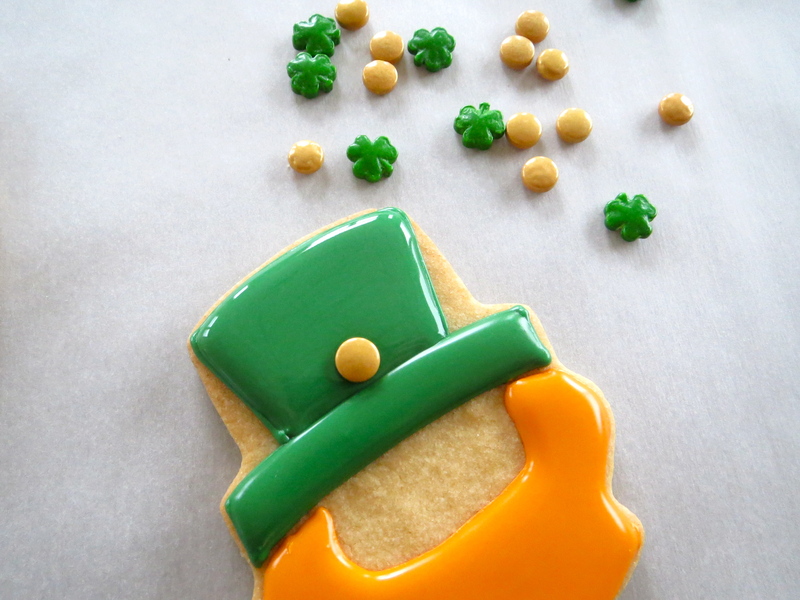 These do take some time and patience to produce (as most decorated cookies do, right?! ), but I love them so much. Definitely one of my faves this season! Merry holidays to you, my friends. I hope I get back here to share another tiny tutorial with you before next Christmas. 😉 Until then, happy baking…or more importantly, happy cookie EATING! 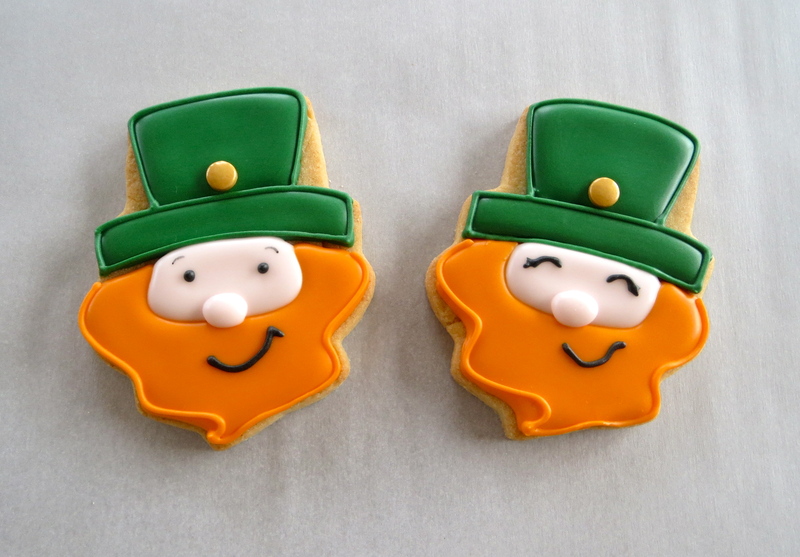 St. Patrick’s Day is only a few days away! 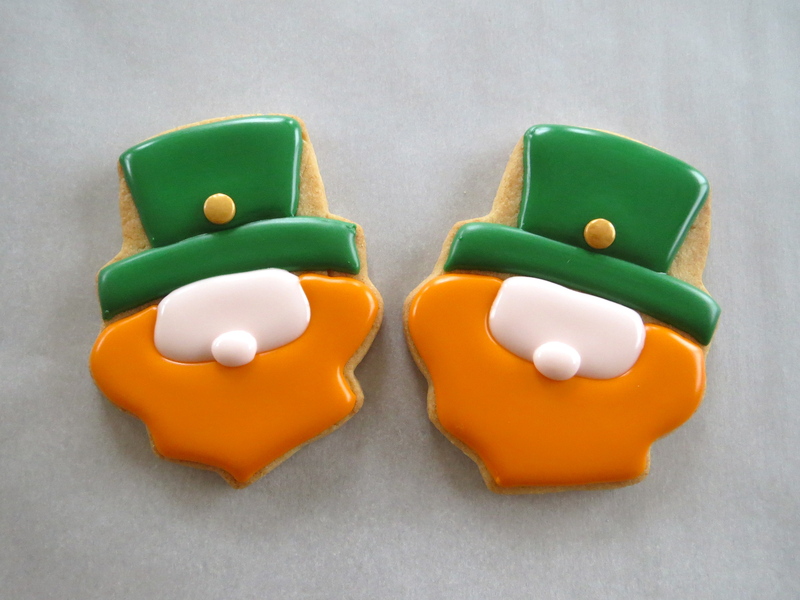 If you are a baker and you’ve put off wondering what to make for this Everyone-is-Irish holiday (as I have put off writing this post), then I am here to finally help you out. Time’s a wastin’, so lets begin! 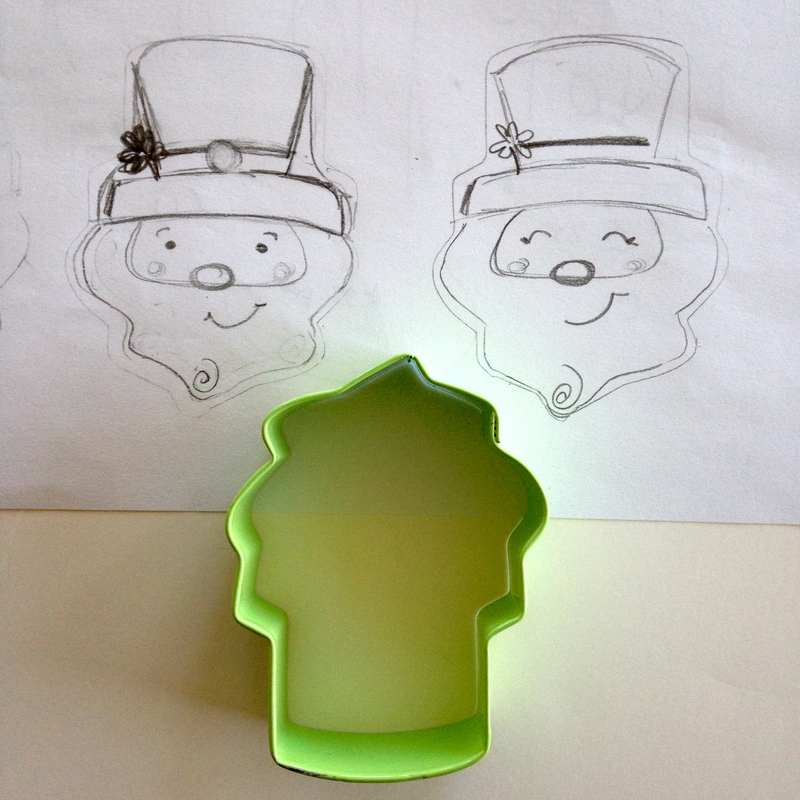 My leprechaun design started by tracing an ice cream cone cookie cutter on paper and a creating few sketches as a guide. This particular cutter came from a Wilton Ice Cream set. Once your cookies are baked and cooled, form the beard and hat as shown. Leaving a bit of drying time in between each section will keep them segmented, which was the look I was going for. Not necessary, but just an option! You can place a gold sprinkle on the hat while the icing is still wet, or you can add it later with a drop of icing to “glue” it in place. I didn’t end up using the shamrocks, but have a go with them if you’d like them as decoration instead! Next fill in the face. Let dry several minutes, then add a nose. 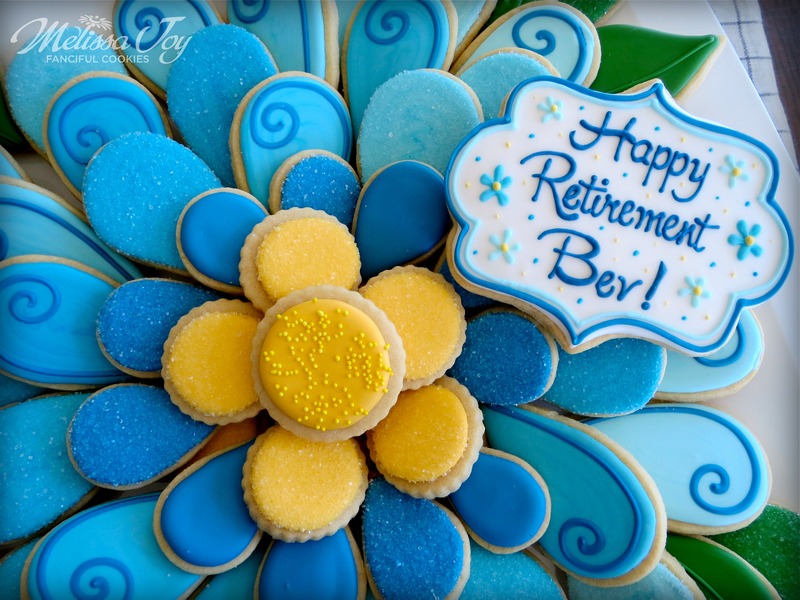 The cookie should dry overnight before adding any details with food writers, unless you plan to complete the rest with icing. The following day I outlined the beard and hat with coordinating colors, and added most of the facial features with black icing. So who gets lucky? 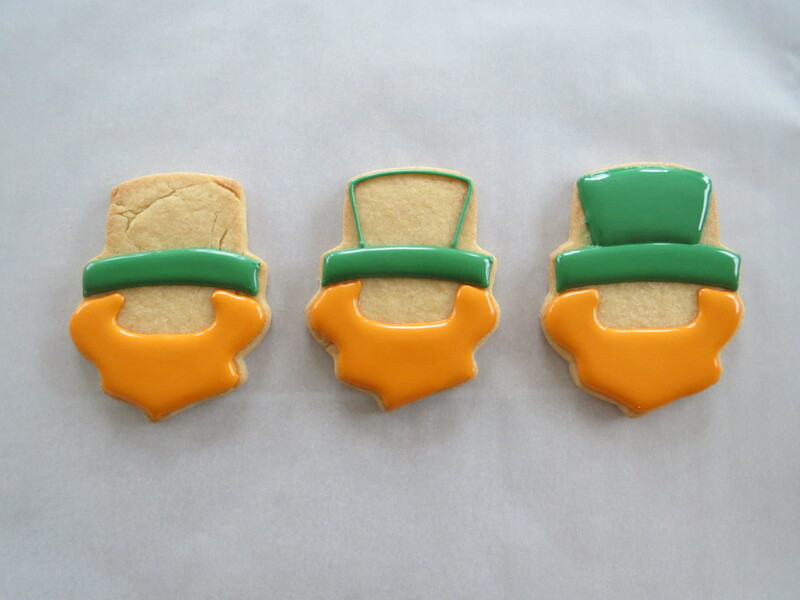 The one who receives a few handsome leprechaun cookies this St. Patrick’s Day! The Halloween season is upon us! 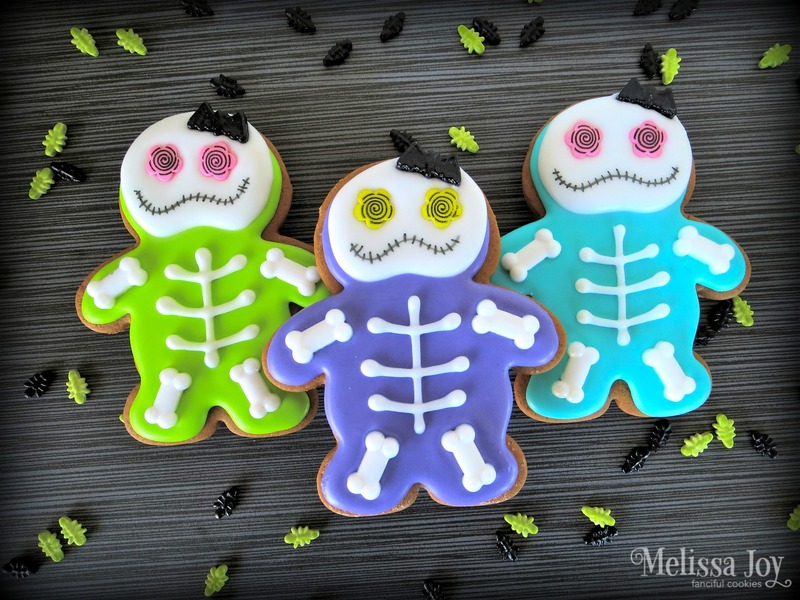 If you are looking for a quick and simple cookie treat that is all cute and no spook, I’ve got just the design for you. 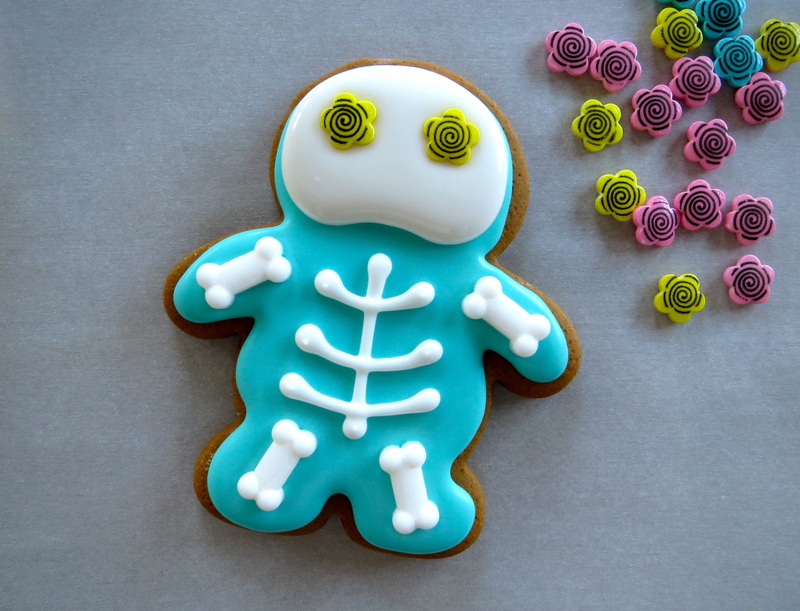 It’s a simple skeleton cookie with a Day of the Dead skull vibe that will be just the thing for little goblins! I gathered inspiration from a few of my favorite cookie peeps (I’m looking at you Make Me Cake Me and Munchkin Munchies!) 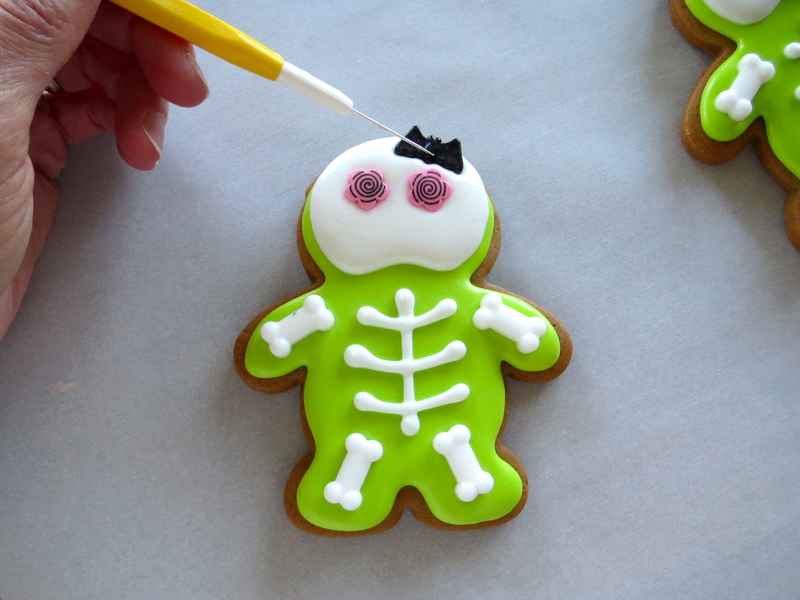 and came across the perfect decorating sprinkles to create these easy Halloween skeleton cookies. Here’s a brief how-to for you to try! 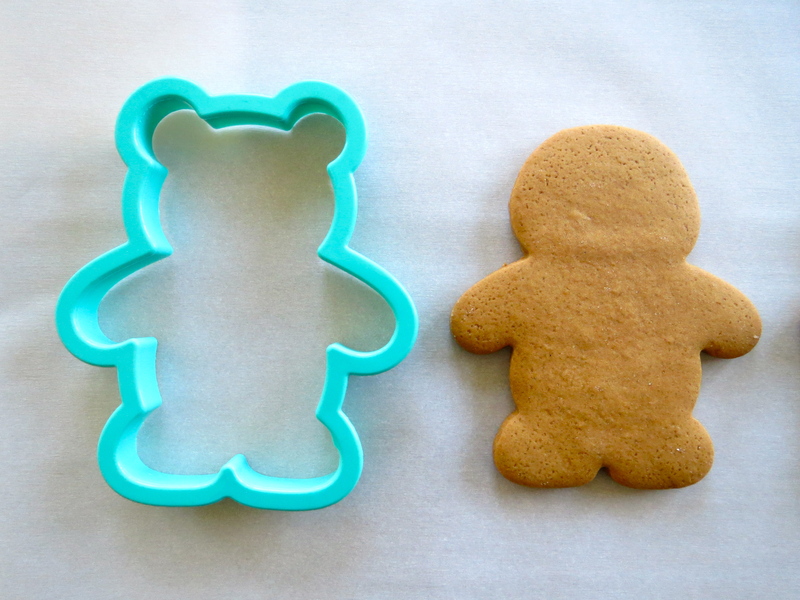 Start with your favorite roll out cookie recipe and a gingerbread man cookie cutter. I loved the general look of this bear cutter, so I trimmed the ears off before baking to make my skeleton shape. It worked like a charm! Ice the entire base of the cookie and while it’s still wet, drop bone sprinkles where the limbs would be (these particular candy decorations I found at Target). Let the icing slightly set, about 30 minutes. I use an oscillating fan or small portable heater fan to speed up the drying process. Included in the jar of bone candies I mentioned above were these black bats. I stuck a few to the top of the skulls when the icing was still soft to simulate a batty bow. Just an FYI, they were sort of large, so I had to hold it in place a few extra seconds to get it to stay. Looks sweet though! 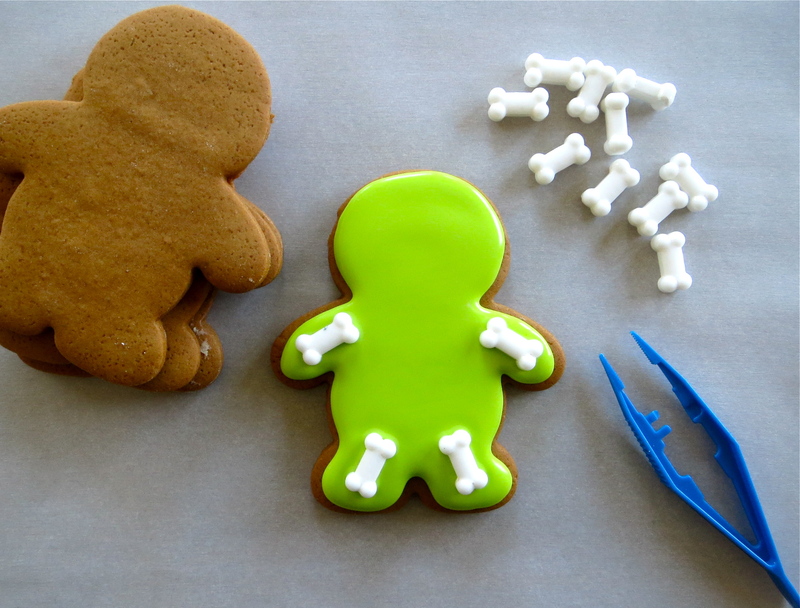 Once the cookies are completely dry*, preferably overnight, finish the skeleton cookies by drawing a big smile with an edible food marker. *My impatience in waiting to see the end result caused my marker to go through the icing on a few, so really, try and wait. When this occurs there will be marker bleed and frustration and then shame. I hate messing up at the very end because of my restlessness. ARG! And they’re done! 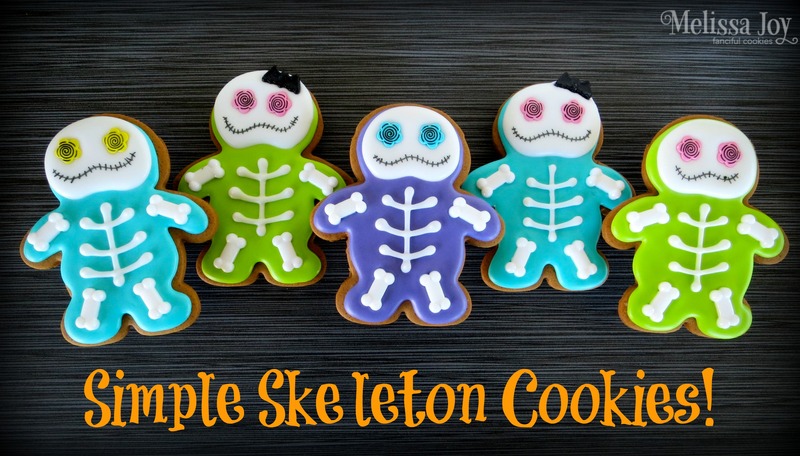 My cute-not-scary easy skeleton cookies for Halloween! One last note, dear readers…I created these guys for this year’s 4th annual Go Bo! Foundation Bake Sale, held in beautiful Door Co., WI. This cause is so dear to my heart, because it is based on the notion of kindness and was started in honor of a young man wise beyond his mere 13 years on this earth. Bo Johnson was a boy who’s message to us all was to help one another out, pay it forward, and to always be kind. After his passing from a rare from of leukemia in 2012, the Go Bo! Foundation was created by his awesome mom, Annika. This non-profit helps kids with cancer and their families by assisting them financially, as well donating to organizations dedicated to childhood cancer research. Find more information about the bake sale on the Facebook page, Go Bo! Foundation Bake Sale, and the foundation it supports at www.gobofoundation.org. 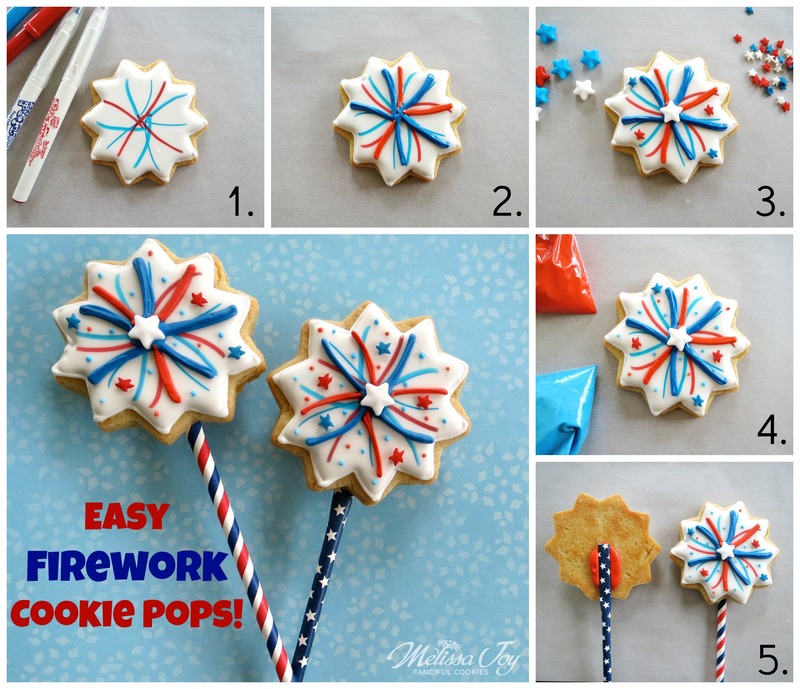 Easy Firework Cookies for the 4th! There is still time left to put together cookie pops before the 4th of July weekend! So fun. So easy. So festive! I posted a tiny tutorial on my Facebook page yesterday, but wanted to give you more details about it. Follow along! I used a pointy scalloped cookie cutter (is that what you’d call it?) 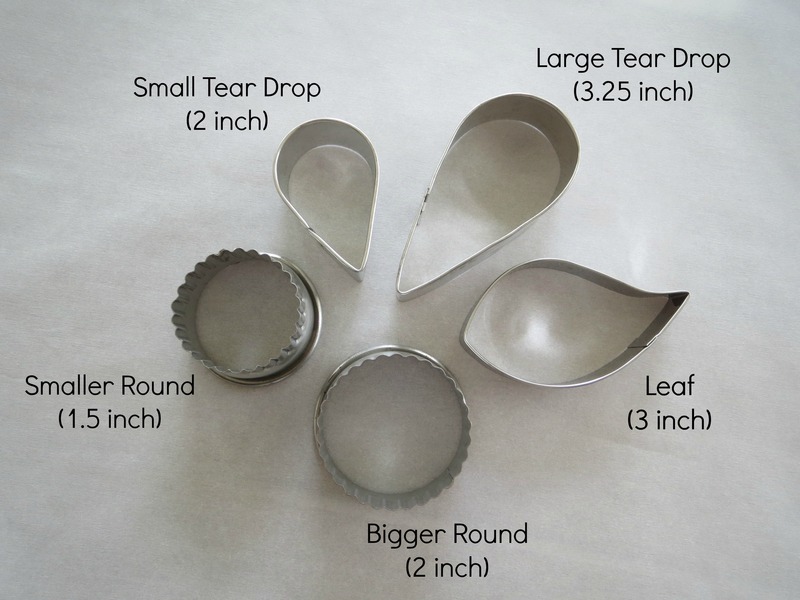 for these, but any round or flower cookie cutter could work. Ice your favorite baked cookies in white royal icing and let dry fully…overnight is best. 1. With food writers, draw slightly curved lines in blue and red, radiating from the center. *I chose the Americolor brand this time. 2. Create the same curved lines with red and blue icing in between your drawn lines. *I used snack size ziplocs to pipe this icing. Just cut off the tiniest part of the corner and you’re good to go! 3. Grab different sizes of star sprinkles. Place the largest star you have in the middle and accent with smaller stars around the rest of the cookie, adhering the stars with a dot of RI. 4. Add a few tiny dots of red and blue RI in the spots that need a little more detail. 5. 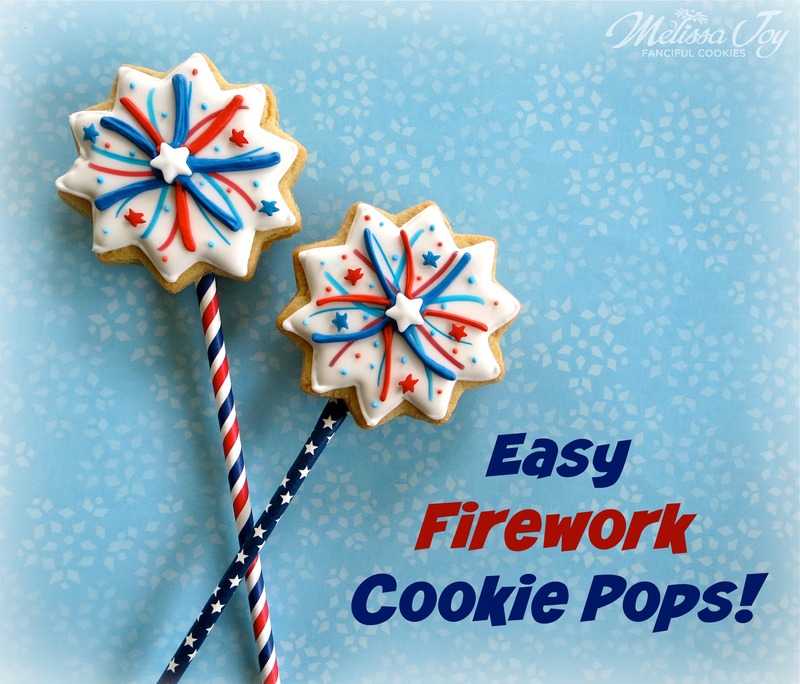 The firework cookies are fine decorated just as they are, but if you’ve snagged something like these adorable stars and stripes straws (darn you, Target dollar bin), continue to this next step! 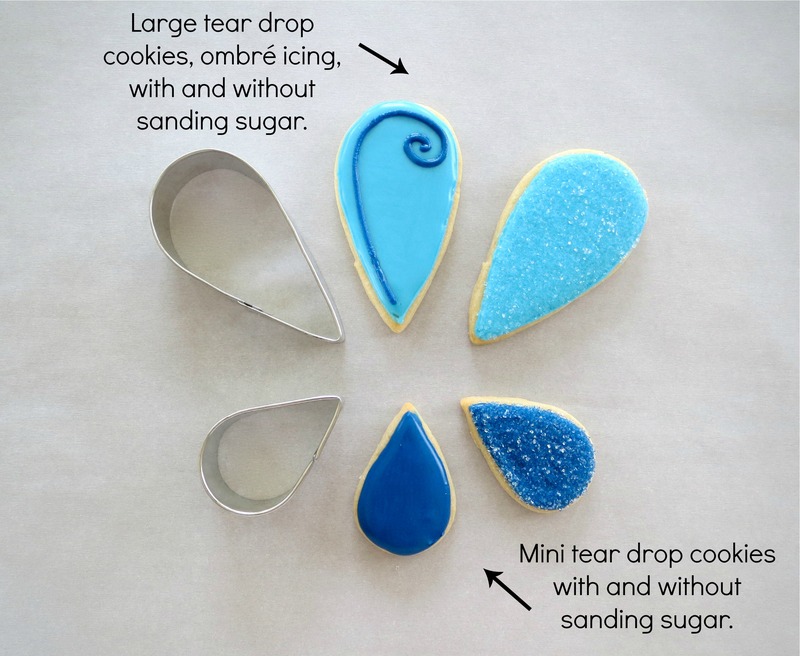 Squirt a blob of icing on the back of your pretty cookies. Flatten one end of the straw first (I don’t know if this makes a difference in getting the straw to stick, but for some reason, I just do it.) and squish the straw into the icing. Let dry for several hours until hardened. Easy firework cookie pops done and ready to enjoy! These are so simple. No doubt the kids can decorate them for you. Keeping them busy will give you more time to get ready for all your other 4th of July rituals! Have a wonderful Independence Day weekend everyone!